Gleaming and electric, this complex 9-1/2 wide x 8" deep x 8-1/2" high Arkansas rock crystal cluster is actually several clusters on pale grey sandstone matrix intergrown with more crystals. And more crystals. Ranging from heavily veiled to absolutely brilliant, the largest is a penetrated, multi-terminated tabular of 3-1/2"x 1"x 1-1/4". 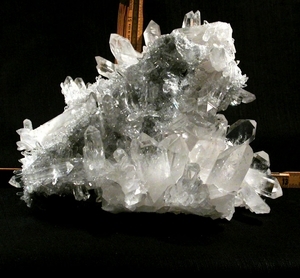 Other individuals include a rare manifestation crystal, an ultra-rare centerpoint [or merlin] crystal, tabular crystals, penetrators, doubly-terminated, twin, 7h faced. Vibrant, technicolor rainbows are in abundance - ask for more photos. Amazingly, only 5 crystals suffered mining damage, extraordinary for a piece of this size and delicacy - few others are in parallel growth and elestial regrowth. Devic veils, foils, record keepers: a powerful, handsome prize.